Once your Christmas cake is nicely matured and well-fed on brandy, it is time to decorate the bugger. In my opinion it is best to go all-or-nothing; either don’t decorate at all or go crazy. Traditionally, in England at any rate, you need a layer of marzipan and a layer of royal icing. 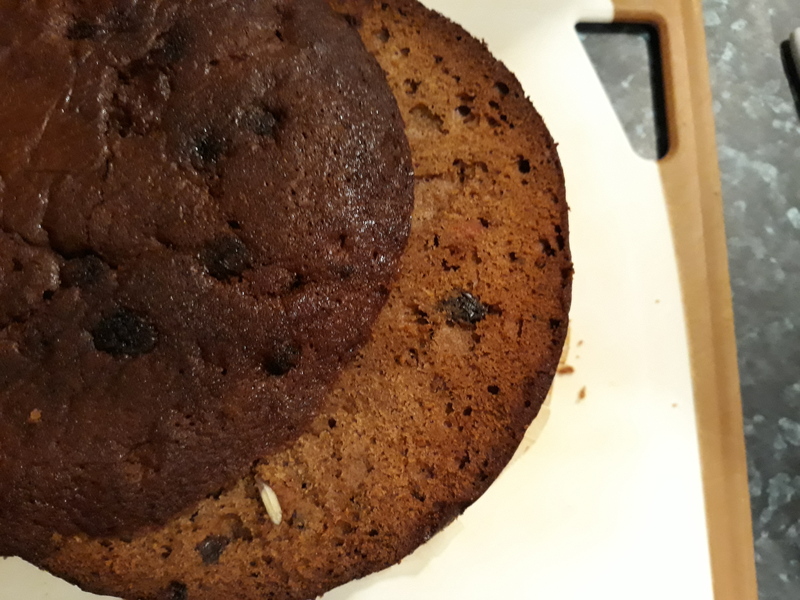 Though I have seen recipes that have a bakeable marzipan and no icing, which I must admit is attractive, but I keep it traditional, even though I am not really bothered about the icing. No, I do it simply for tradition’s sake. 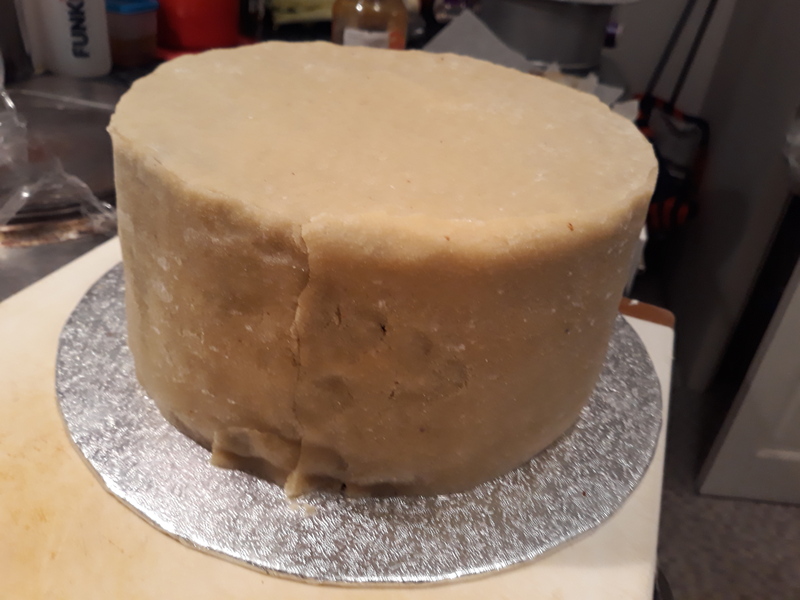 I gave the Christmas cake recipe that I use in the previous post, so if you have made one or have a bought undecorated one that you want to put your own stamp on, I have recipes for marzipan and for royal icing too. Don’t forget to add some festive bits and bobs too. Aside from being used as a sculpture material, marzipan also became a popular sweetmeat used by chocolatiers and bakers. Some of my favourite cakes use marzipan: Battenburg, stollen and simnel cake. 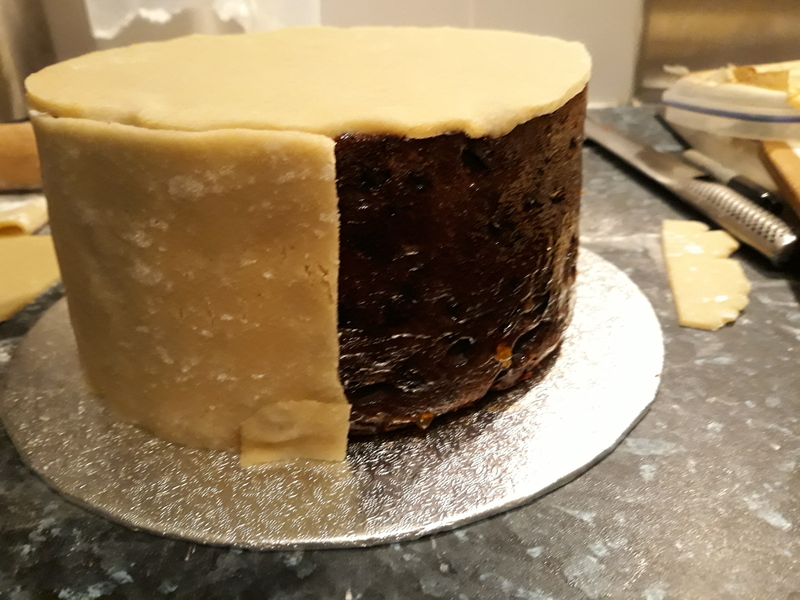 The Christmas cake got its layer of marzipan because the Twelfth Night cake – traditionally covered in it – was banned by the Puritan and Lord Protector of England, Oliver Cromwell as too frivolous, so people added the marzipan they loved so much to their Christmas cake instead. Here’s the recipe I always use these days. What I like specifically about this recipe is that it is not too sweet, which I think the bought stuff always is. Also, when you make your own marzipan, it has a much better texture as well as flavour. You can add extra things to the mixture if you like, such as the grated zest of an orange, or a couple of teaspoons of orange flower water or rose water. Sieve the icing sugar into a large bowl and stir in the caster sugar and almonds. Stir in the beaten egg and lemon juice to form a paste. Knead the marzipan on a surface floured with icing sugar. Easy. Wrap and allow to chill in the fridge for a few hours. 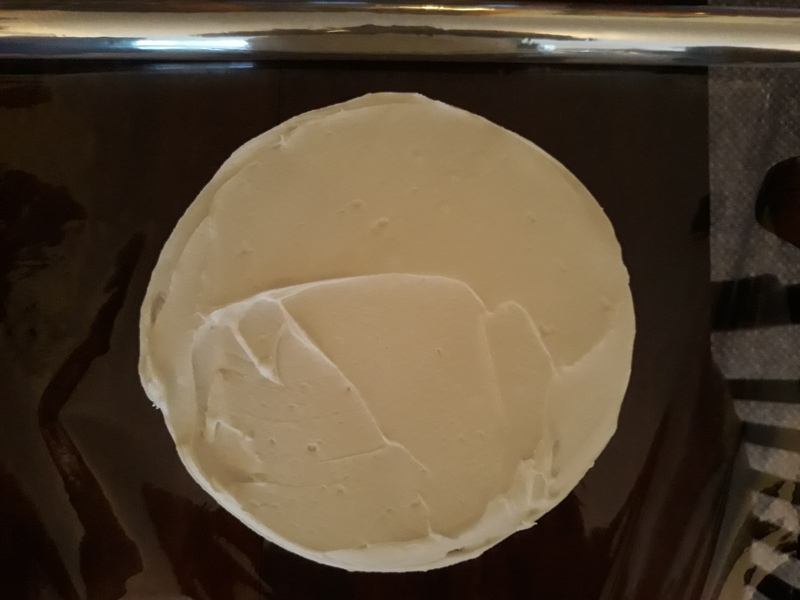 To cover the cake with it, you first need to slice the top of your cake off so that it is a nice, flat surface. I always like that bit because I get to try the cake. Next, turn it upside down and pop it on a cake base or plate. Warm up the jam and water in a pan and paint the whole cake with the glaze. 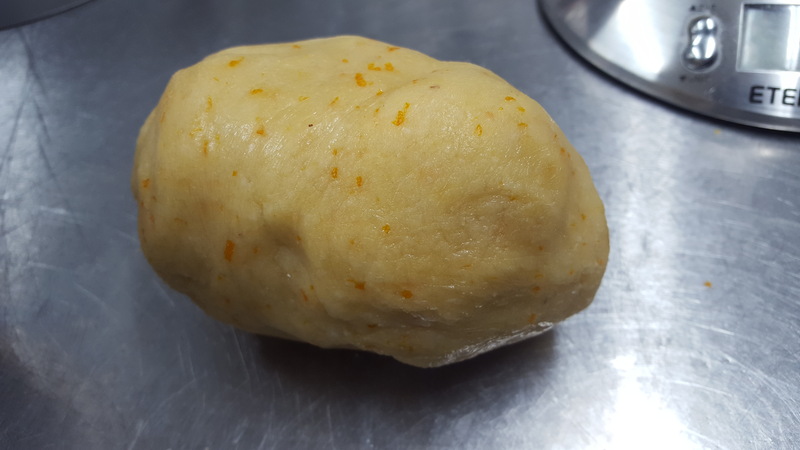 On a sheet of greaseproof paper, roll out a little over half of the marzipan into a round shape that is just a little larger than the cake itself. The greaseproof paper makes it easier to roll out, but you can use an icing sugar dusted worktop instead. 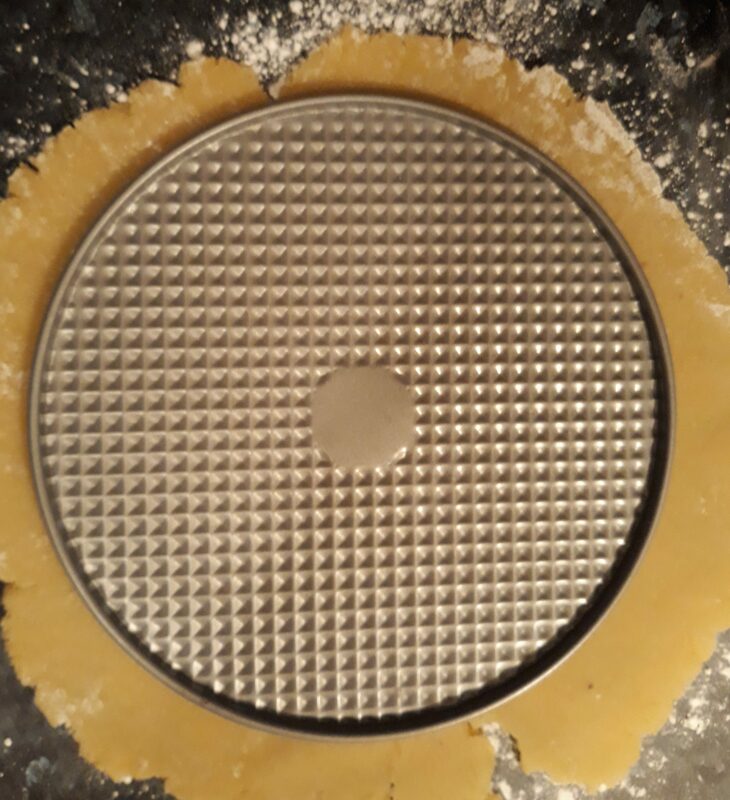 Use the cake tin as a template and cut a circle. Pick up the marzipan still stuck to the paper, place it on top of the cake and peel off the paper. Next, take the remaining third of the paste and roll that out into strips the same height as the cake and secure them to the cake. Press the edges together as you go as well as any cracks that may appear. You need to leave the cake for a couple of days to dry a little before adding the icing (should you want to). Royal icing is the classic icing for the Christmas cake – it is ‘royal’ because it was the British Royal Family that used in for their wedding cakes, and naturally if the Royals did it, then we copied it. Icing had been around since the eighteenth century; before that, there wasn’t the technology to refine the sugar appropriately. The first icing was similar to royal icing, it was spread over the top of the cake but then the cake was returned to the oven to set hard. The final result was a nice flat, shiny surface like that of a frozen lake, hence we call the stuff icing. 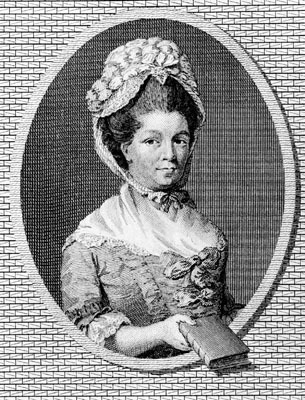 Elizabeth Raffald mentions it in The Experienced English Housekeeper (1769) – the first written recording of the word. Whisk the egg whites until frothy but not yet stiff and then stir in the lemon juice. Add icing sugar to the egg white bit by bit, mixing as you go – an electric beater comes in very handy here, but you can use a wooden spoon if your forearms are up to the job. The icing can be used straight away. Spread the mixture all over the cake using a palette knife to smooth it out. Dipping the knife in very hot water is a good way of getting the icing super-smooth, but I like it a bit more rough-and-ready. You can reserve some of the icing for piping of course, but that has never really been my thing – I should have a go one time though! A simple and effective way of decorating the cake is to use the side of a knife to make a nice spiky snow effect. When decorated, leave it for two or three days to set hard. If you look at old recipes for puddings, you’ll find they often require macaroons; sometimes as the sponge to soak up the booze at the bottom of a trifle, crumbled over the top of a dessert or used as part of the base to a cheesecake. 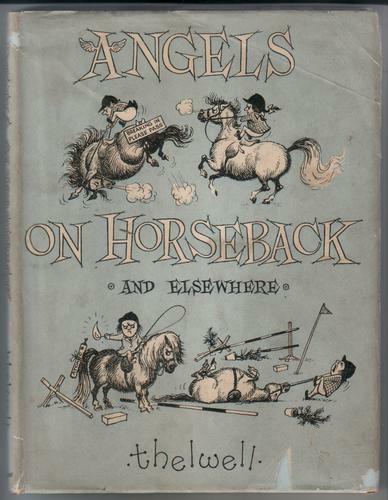 Indeed, in Jane Grigson’s English Food, macaroons are needed for several recipes. She doesn’t give a recipe herself, and seeing as one of the blog’s roles is to try to fill in all the recipes that were omitted from English Food. If it had appeared, it would have been in the Biscuits section of the Teatime chapter. However, don’t get macaroons confused with coconut macaroons – they are a relatively modern invention, old receipts require the classic macaroon, made of stiffly whipped egg whites and ground almonds. They are quite hard to find these days. If you are lucky, you might find them in a french bakery. Indeed, they are called french macaroons in America, and are found miniature-sized and sandwiched together with some buttercream. Delicious, of course, but no good for baking with. 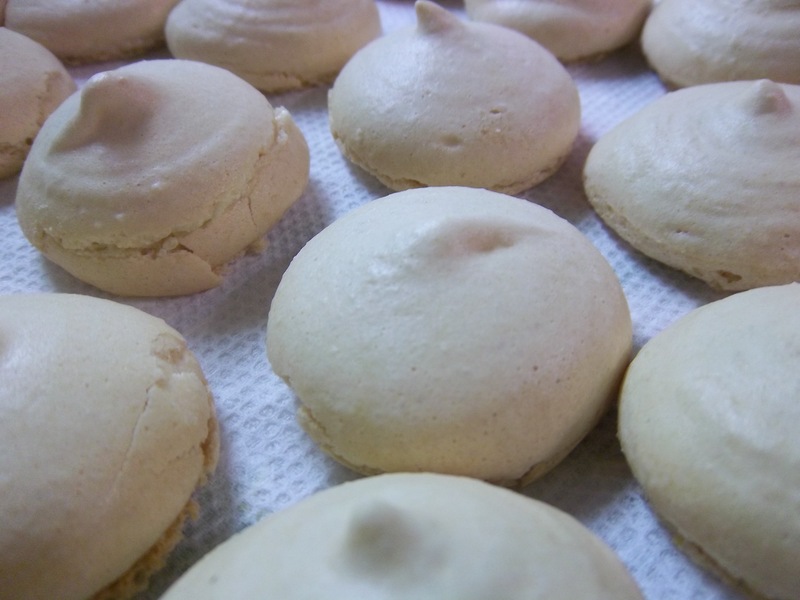 The traditional macaroon is part-biscuit (cookie), part-meringue, wonderfully chewy and sweet. They are quite easy to make, though the mixture does need to be piped onto a tray. I recently made some for the 300th recipe for my other blog as part of a trifle. Luckily for me they would be drowned in dessert wine and then covered with custard, so a deft piping hand was not required (as you can see in the pictures below). 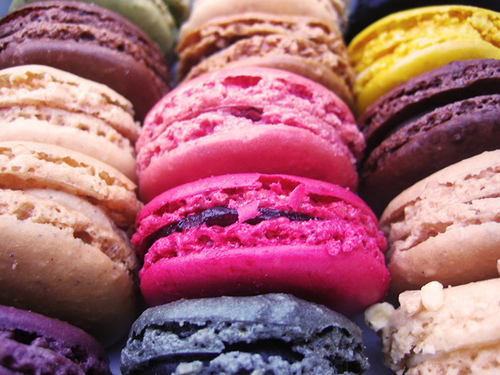 Macaroons were originally invented by Italian monks and became popular in France in the 1530s when the pattisiers of King Henri II’s wife used the Italian recipe and started making them for the court. 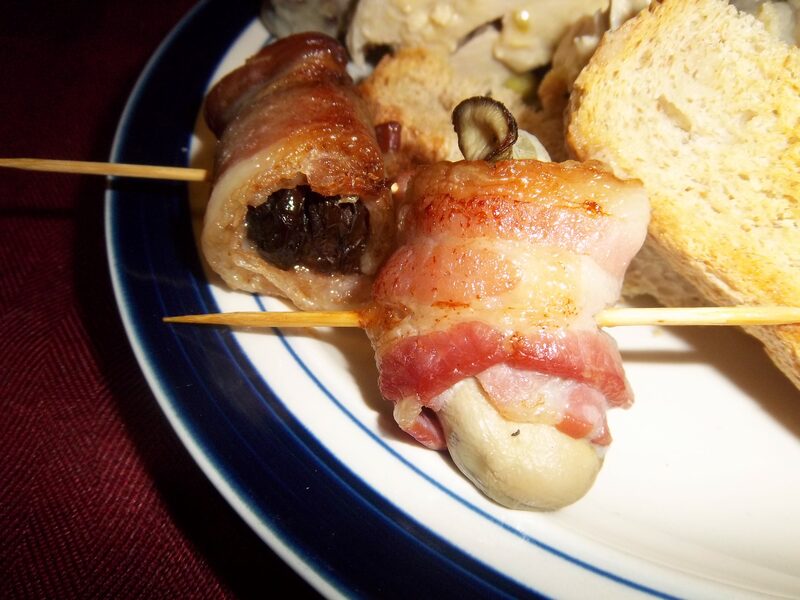 I dont’ know when they eventually made their way to Britain, but I am sure it was pretty soon after that, as French and English cuisine was very similar and they were always looking toward each other for inspiration, especially in those times. Most recipes from around that era are very difficult to pronounce either French or English as everything overlapped so much. It wasn’t until the twentieth century that the idea of making tiny ones glued together with buttercream took off. My recipe below is based on two others: one from Elizabeth Raffald’s 1769 book The Experienced English Housekeeper, and the other from Martha Stewart’s website of all places. The older recipe includes orange flower or rose water, which was not used as a flavouring per se, but as a way to prevent the whole almonds turning into a paste when they were being ground. I like the taste, however, so I have included it in the recipe. Begin by mixing together the icing sugar and the ground almonds. 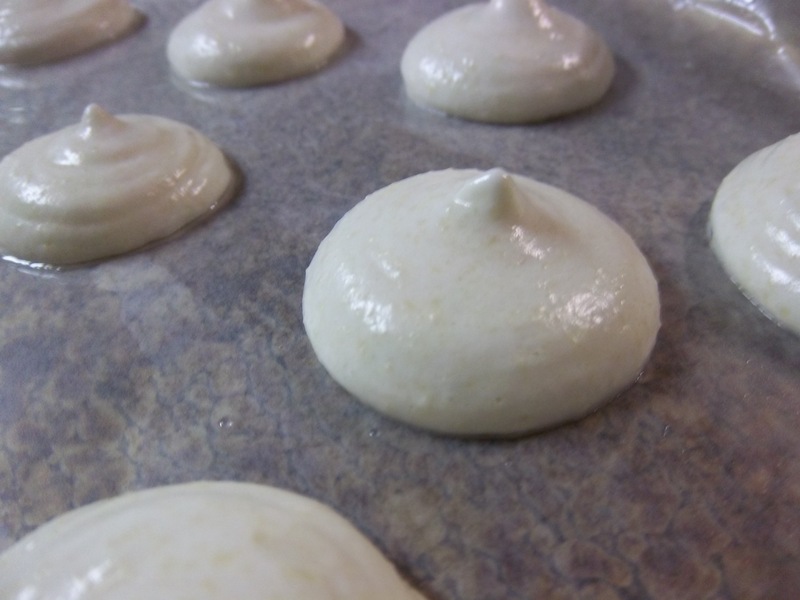 In a separate bowl, whisk the egg white and salt until they form stiff peaks, i.e. if the turn the bowl upside down, everything stays within. Whisk in the caster sugar gradually so that the egg whites become glossy. Mix in the orange flower or rose water. Next, using a metal spoon, fold in the icing sugar and almonds. Take your time here as the mixture gets thick and tacky, and you don’t want to lose all the air from your whisked eggs. Line a baking sheet with baking paper and grease it lightly. Pipe out the mixture leaving some space between each one as it will rise in the oven. 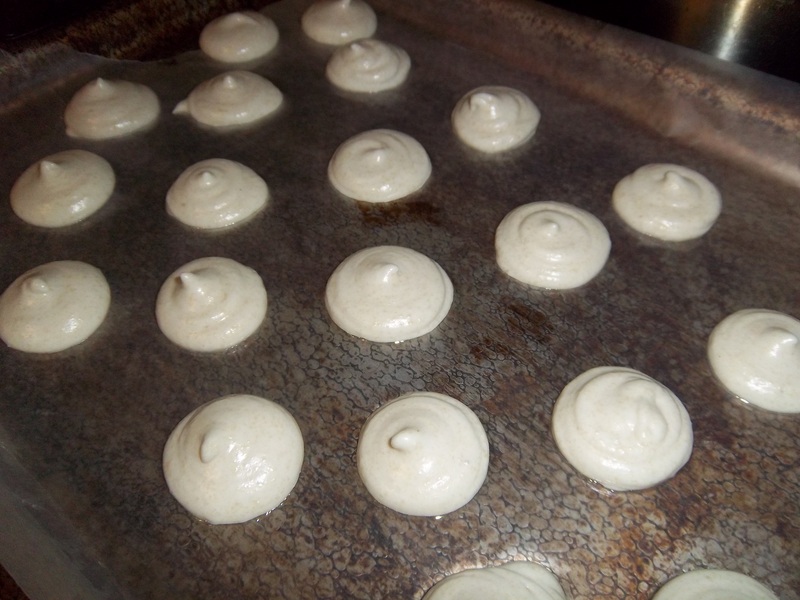 For small macaroons, use a number 4 tip, for larger use a bigger size or pipe out in a spiral shape. 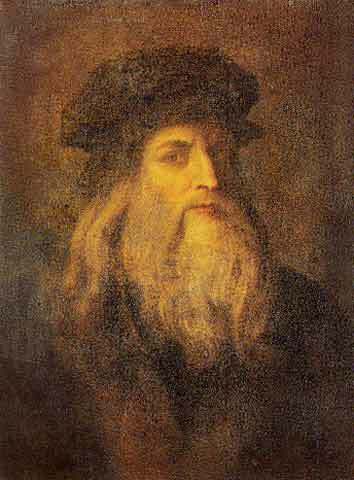 It’s up to you how careful you are – the classic shape is a dome. Leave to dry for 15 to 30 minutes, depending upon size and humidity before baking at 180°C (350°F) with the oven door slightly ajar (use a wooden spoon handle!) for between 15 and 25 minutes, depending on size. You can tell when they are done when the tops go from shiny to dull. Remove from the oven and allow to cool on a rack.